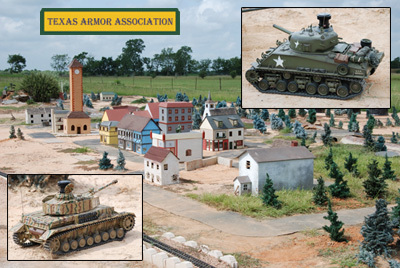 The Texas Armor Association is an RC tank club that utilizes the Tamiya Battle System or any System that is Tamiya Compatible. Even though we use the Tamiya and compatible battle systems. All other non-Tamiya compatible IR battle units are welcomed to come join in the fun, this includes Taigen and Heng Long IR battle tanks. Our 7200 sqft outdoor multi-terrain Battlefield located in Monaville, Texas at the famous BOMBER FIELD facility will challenge any tankers skill to negotiate the terrain and operate in a battle while avoiding incoming fire! The terrain is hilly and rolling. There are few straight or clear shots! Our Battlefield is for the exclusive use of TEXAS ARMOR MEMBERS and our guests! Do you want to experience what it's like to be a member of Texas Armor Association? Click Here to find out!